30 mins Cookies ~ No Baking Required ! 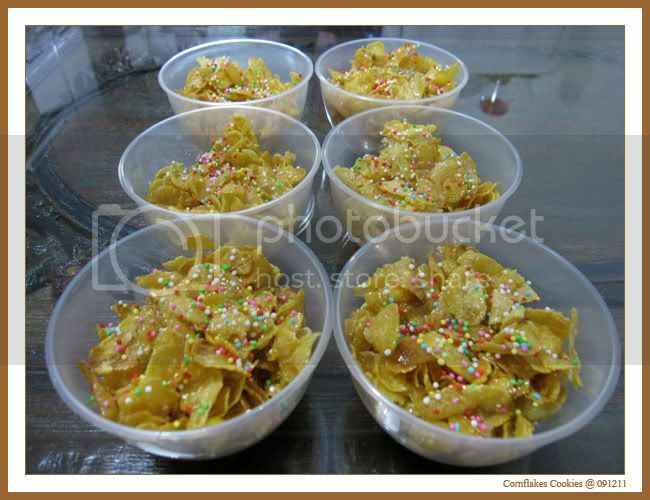 I have always enjoy eating cornflakes cookies and trust me, they ain't cheap if it's home-made. Each bottles with 50 cookies can cost $12 or more depending on types of ingredients. 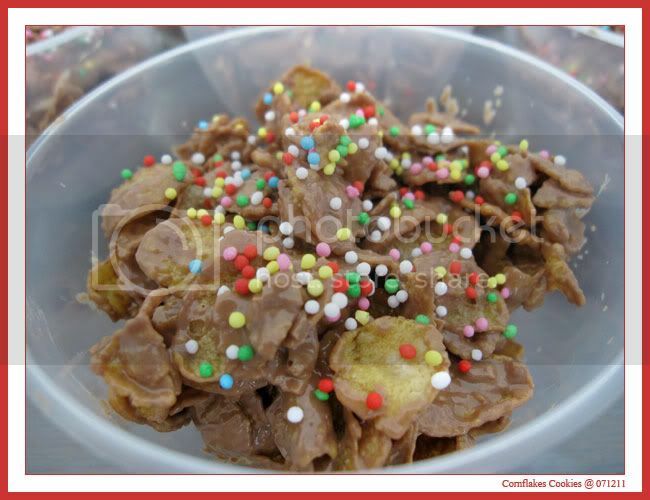 Will "disclose" the magic of cornflakes turned chocolate cookies in colorful "confetti" in 30 mins. 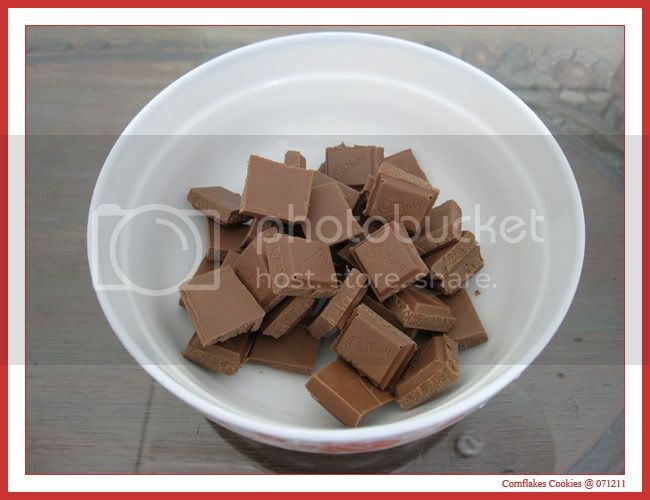 Step 1 : Break chocolate bar into smaller cubes and place in deep bowl. 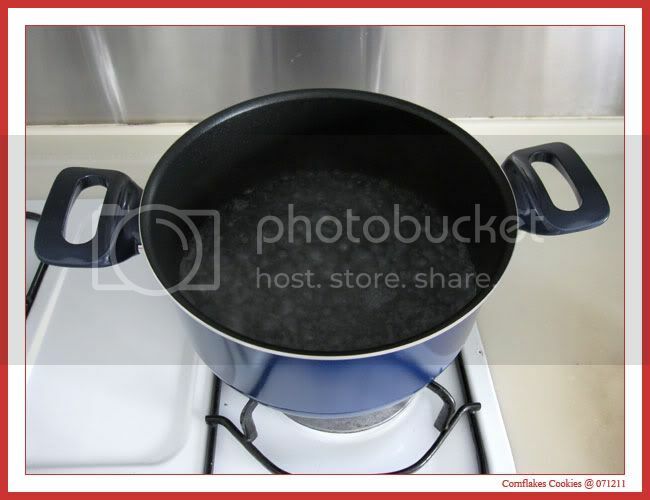 Step 2 : Boil a pot of hot water, off flame once boiled. 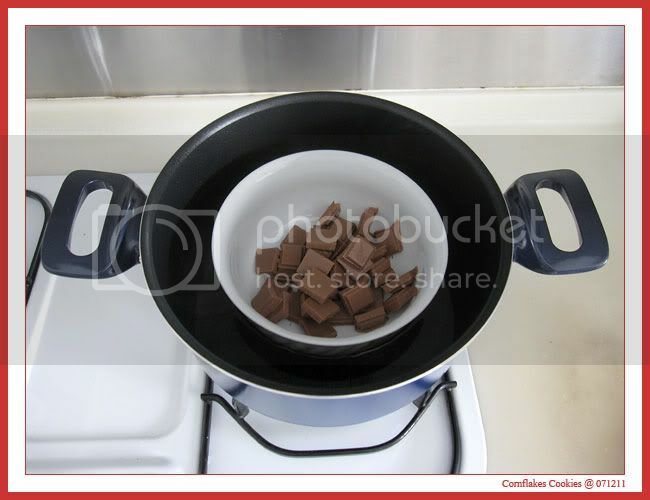 Step 3 : Placed the bowl of chocolate into the hot water. This is to melt the chocolate. 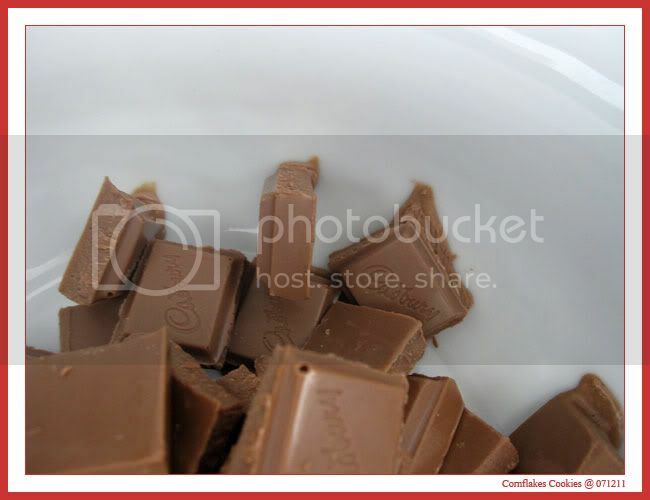 Leave chocolate for 1 min, it will begin to melt quickly. 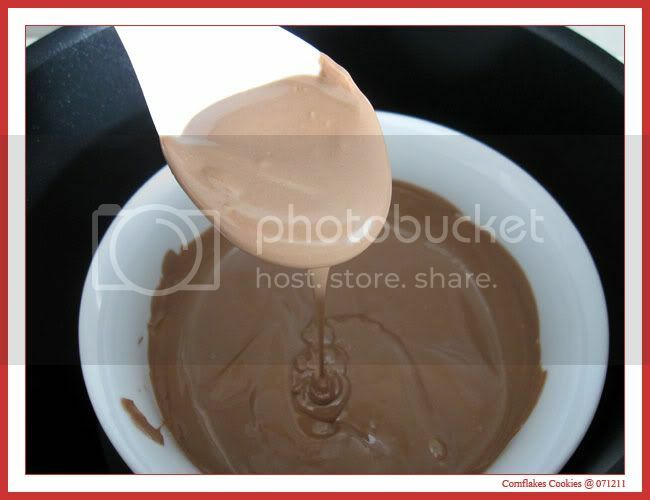 Use a stirrer and stir slowly till chocolate bars all melted into a creamy paste. Takes less than 5 mins to get it done. Step 4 : Remove "hot" chocolate from pot and leave cool for use later. 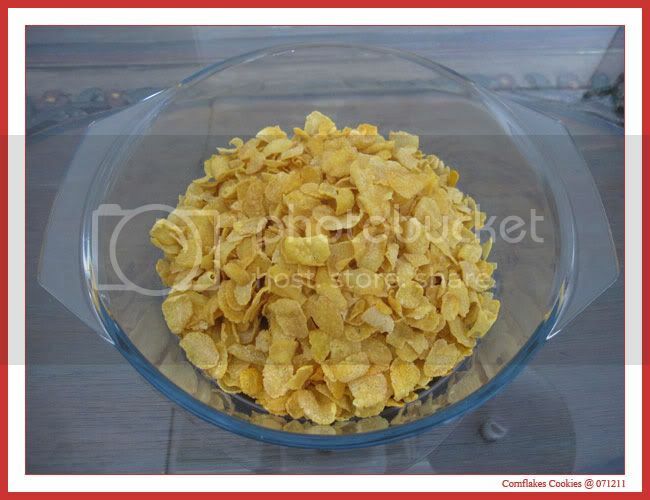 Step 5 : In mixing bowl, pour in 6 cups of cornflakes. 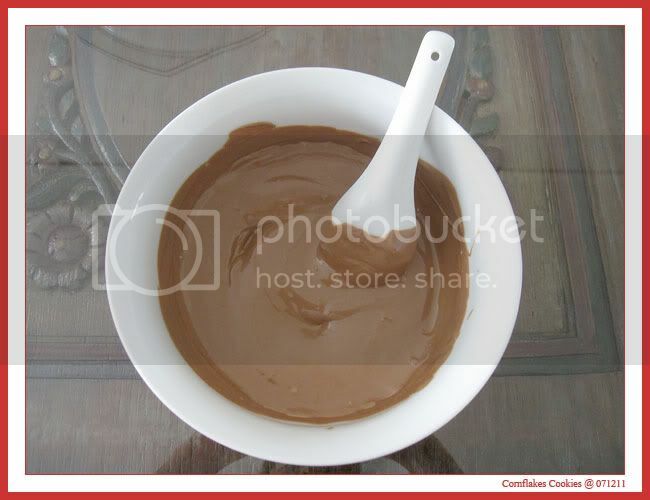 Step 6 : Pour in chocolate paste and mix well. 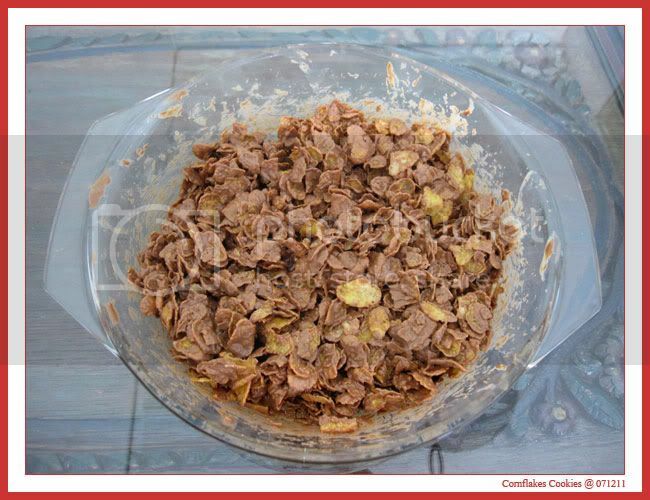 It's ok if some cornflakes are crunch to smaller pieces while mixing. 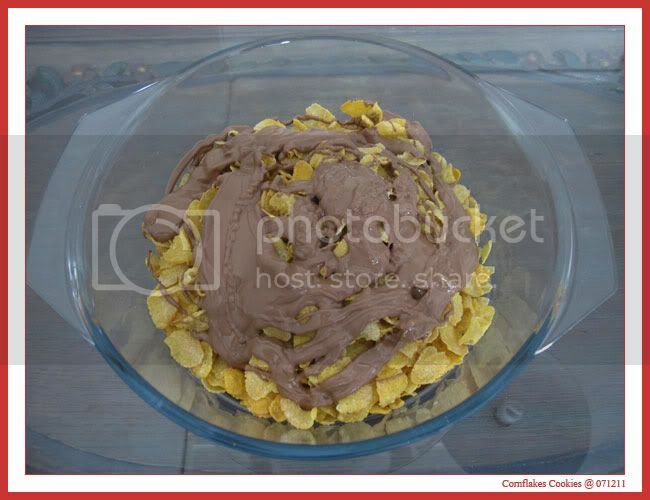 Step 7 : Spoon the chocolate coated cornflakes into bowl. Step 8 : Sprinkle some rainbow balls on top, leave cool and store. * Note the cookies will set into shape once chocolate becomes firm. 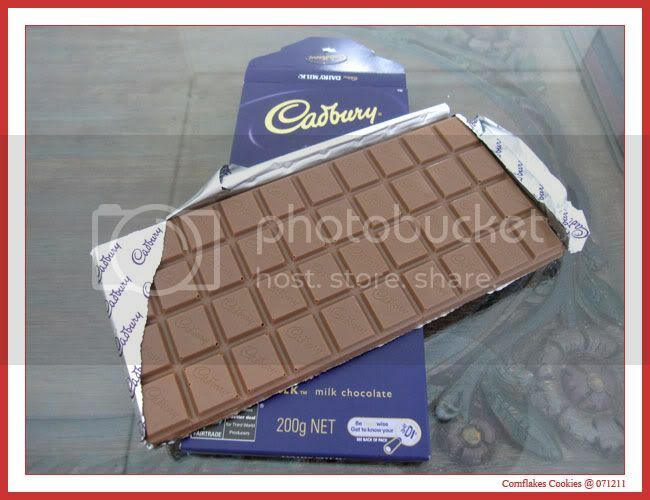 You may put in refrigeration for 10 mins to speed up the time need for chocolate to firm. 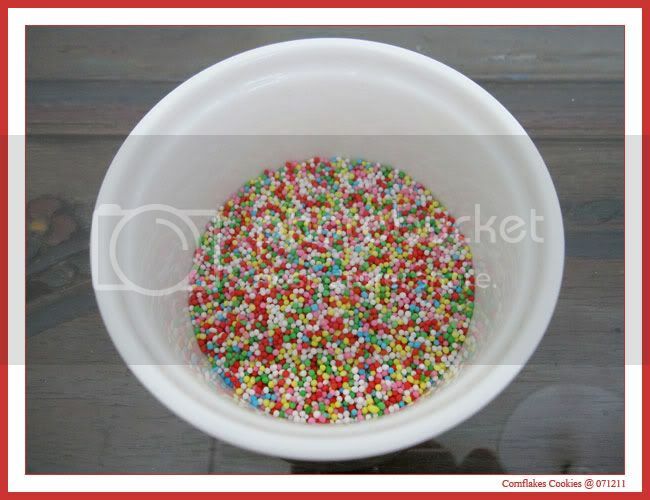 * Can be tedious and messy to scoop mixture into small paper cups. But it's bite size, good as finger food. I choose to use bigger plastic cups as it's self consumption and save on storage space. 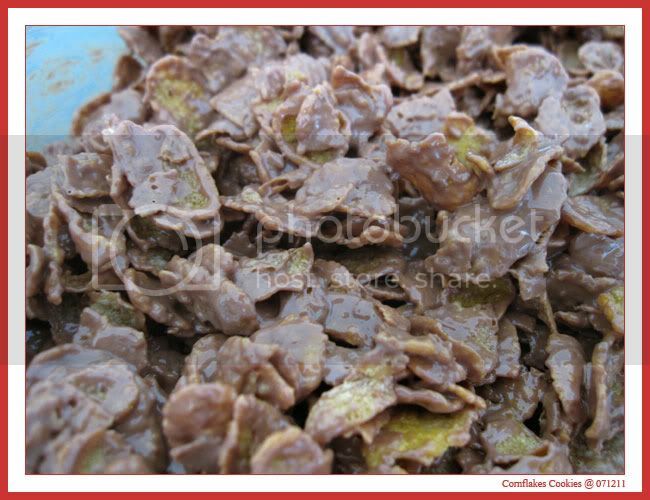 Looks good, though I would have wanted the flakes fully covered with more chocolaty goodness. Aha ! Peace is a chocolate person ! 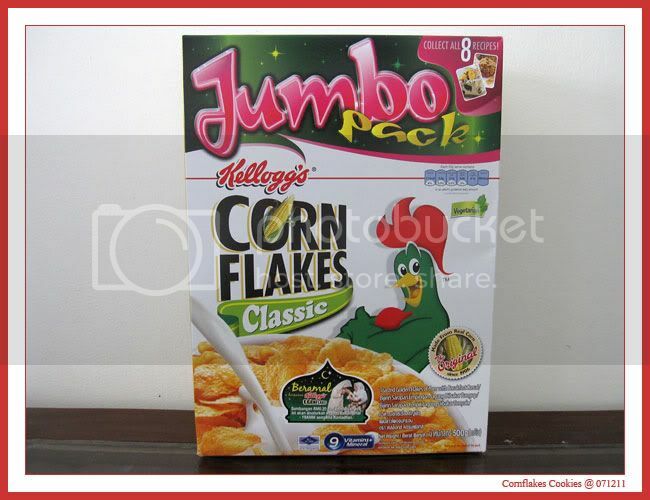 I will increase to 7 cups of cornflakes for next try ... find it too chocolaty to my likings. 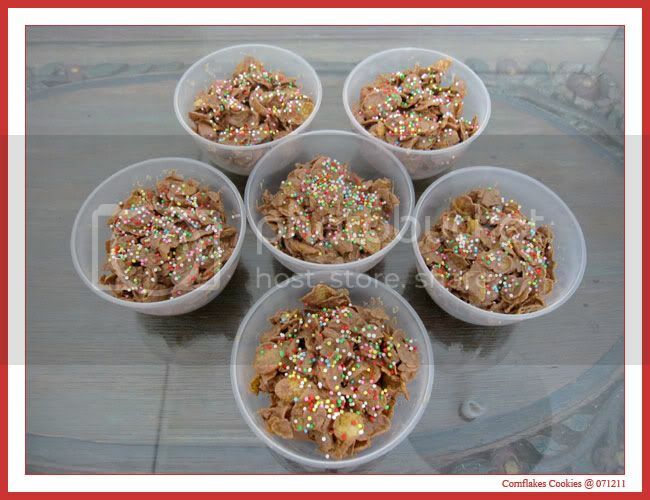 You can simply decrease 1 cup of cornflakes and use 5 and you get more choco coating on each flakes. Alright, let's get all flaky this X'mas ! Not to worry if you do not have an oven, can always use a toaster. 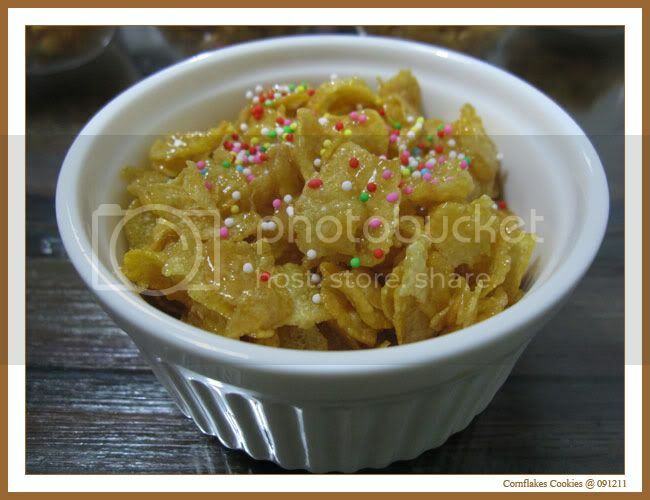 If you have neither, just cool down the butter and honey mixture before mixing in the cornflakes. It taste equally great ! With a sauce pan ... using low heat, melt the butter. Add in 3 table spoon of honey and stir till mixture is foamy. 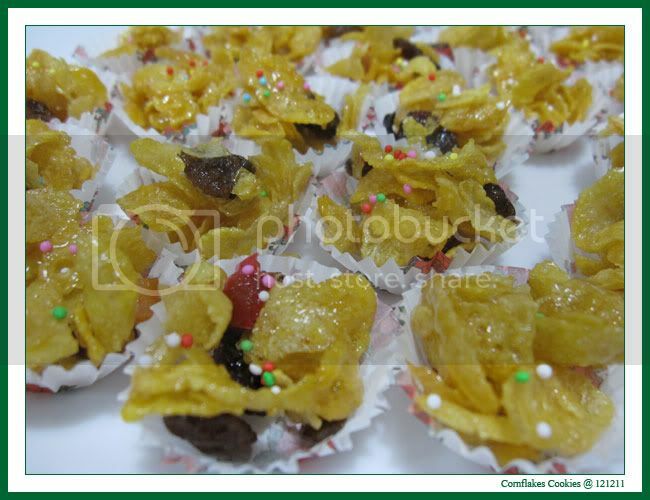 * if you are not baking the cornflakes, make sure the mixture is cooled before adding in cornflakes. 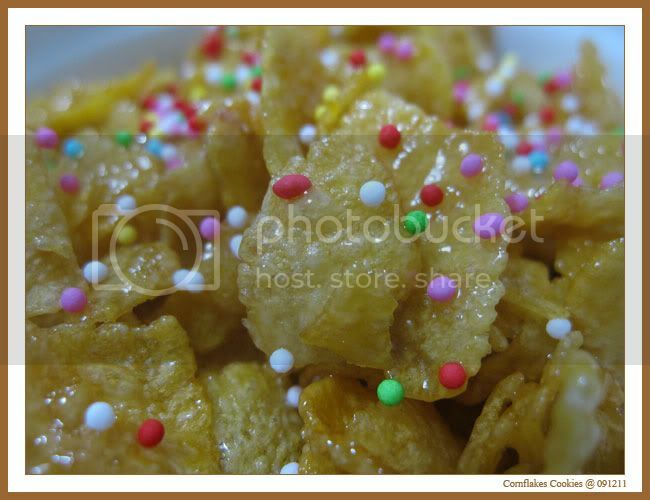 The heat from the mixture will soften the cornflakes. If using toaster, spoon mixture onto toasting pan laid with a sheet of aluminum foil, half open the toaster and heat for 3 mins. 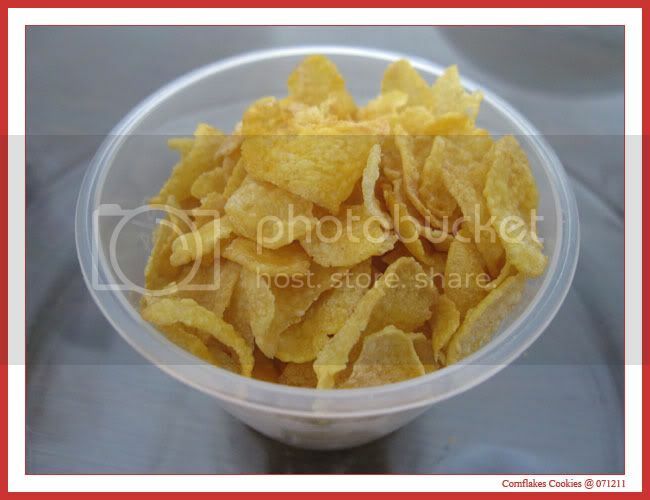 Do check so that the cornflakes will not be burnt as we are using a toaster to crisp and brown the cornflakes. 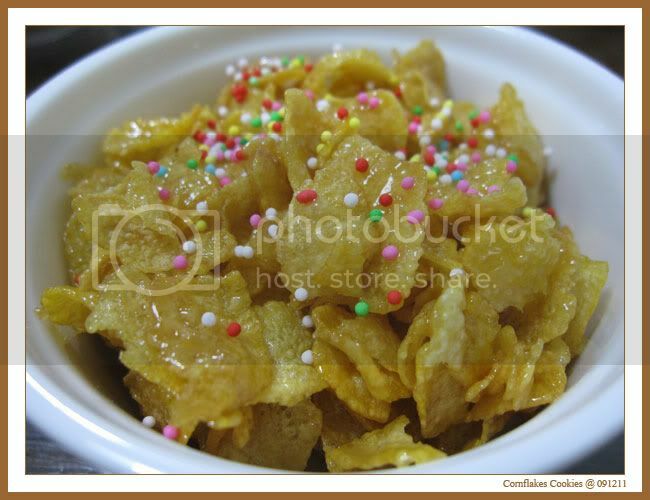 Remove from toaster when cornflakes turn golden brown. 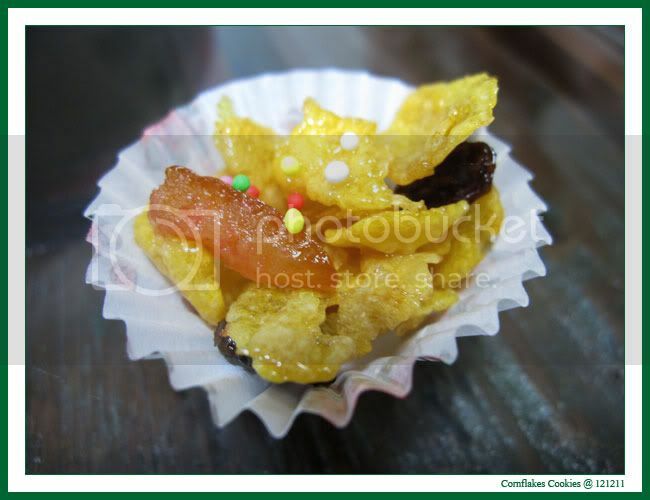 Spoon the cornflakes into small cookie cup, sprinkle some rainbow ball on top, leave cool and store. The cookie will firm and hold into shape when cool off. 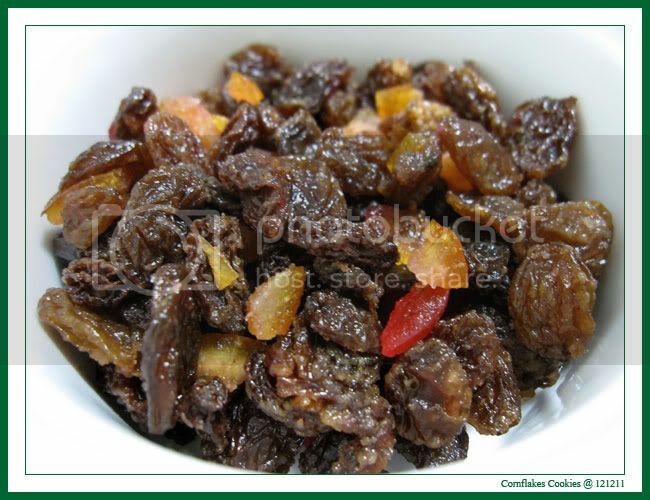 Just another variety ~ reduce one table spoon of honey and replace with 1 cup of dried mixed fruits. 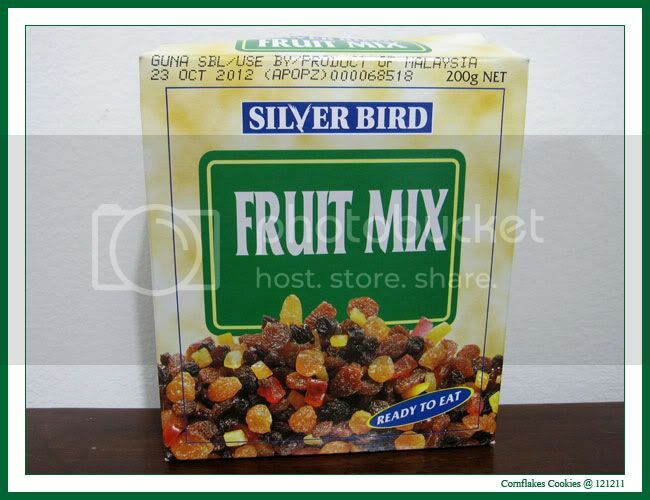 If you like it very sweet, just keep to 3 table spoon of honey and add one cup of dried fruits. This time I am using small paper cup, extremely tedious when filling up the tiny cups. $1.20 for 100 pcs of paper cups. 1 bottle hold 50 small cups ! 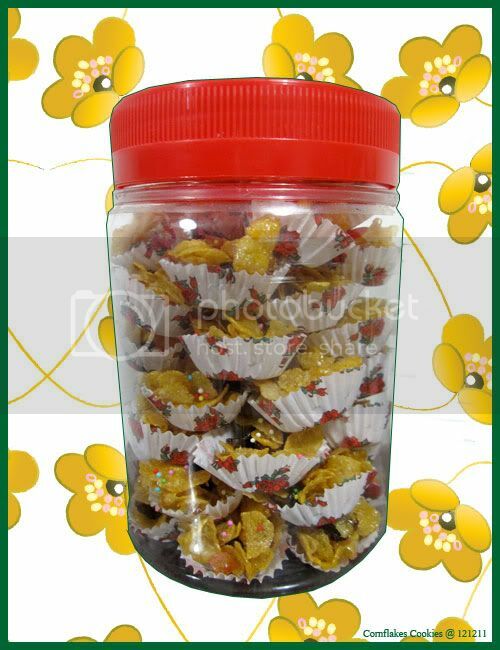 Do not mistaken, am not selling ... just sharing something I enjoy eating during CNY. 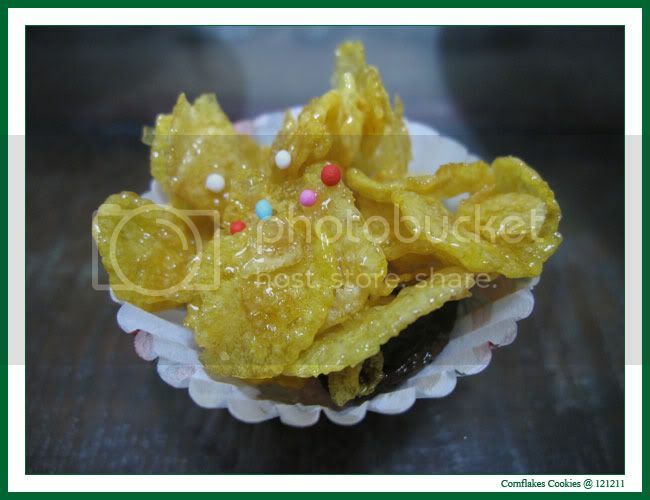 And now I do not have to wait till CNY to get to eat it, I know how to make it myself liao ... happi ! Have finished the 3rd batch in 2 weeks ! * Look presentable hor ?